Nestled amongst Chikmagalur’s coffee plantations, Mocha Chalet is perfect to unwind and experience the planter’s life at a slow pace. Plus, there’s plenty of coffee to give you a caffeine kick. A coffee planter’s life is all about living and breathing coffee. At Mocha Chalet, you get to do all that — in fact, as you drive up the pathway, you are likely to be greeted by the aroma of fresh coffee beans. Breath in all that before you enter the two bedroom bungalow. Well-appointed rooms with all the modern trappings (read WiFi) and an indoor fireplace to keep you warm on chilly nights will ensure a comfortable stay. The bedrooms come with carved wooden beds and look very posh and something to talk about once you return. Or you could just take pictures and send them to your friends to make them very jealous while you’re there. There’s lots of space inside and out, with the living and common room being the ideal spots indoors. 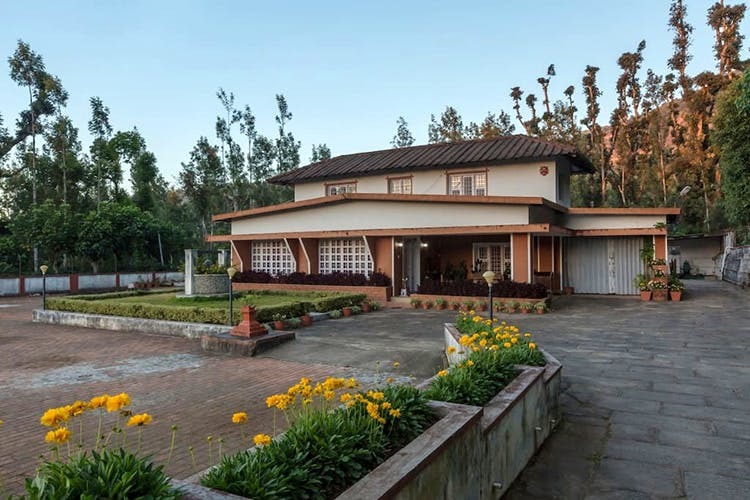 Or you could sit out on the porch and sip your coffee — after all, you are in Chikmagalur. The butler, yup, you will have your own Alfred, is available to help you out with anything you need. We did tell you will be living a planter’s life. Make sure to watch the sunrise from the porch. It’s also perfect for yoga. Evenings, head to the open space for barbecue and bonfire, both of which can be arranged by the friendly Alfred, if you inform in advance. We told you there’s going to be a lot of coffee, right? At the property, cooking classes using coffee can be arranged on request. It’s such as fun family activity no? If you are planning on a more outdoor kind of vacation, there’s the entire coffee estate for you and your fam to trek it up and explore. You will learn the whole process of bean to cup during your trail. You can check out trekking trails such as the Mullayanagiri one, on your own. The Bhadra Wildlife Sanctuary is a half hour drive from the property and you want to pack your binoculars and DSLRs with telephoto lenses if you are to catch sight on tigers, leopards, elephants, and gaurs. The per night charges for this property is INR 7,476 for four people (or two people). You can book the property here.